Hi honey, I'm home! After nearly a month's movie detox after the BFI London Film Festival, I'm back with a review of what is arguably the final in the long tail of summer blockbusters or the first in the holiday season - THOR: THE DARK WORLD aka THOR 2. Their plot hinges on the conceit that the nine realms are about to enter a "convergence" - a planetary alignment that allows matter to pass between worlds or something. An evil elf (I kid you not) plans to use some WMD called the Aether to cause interplanetary chaos at just this point. Problem is, that space-WMD has been magicked into Thor's girlfriend Jane, and when he takes her to Asgard for safe-keeping, the elves lay waste to his home planet. He then teams up with his evil brother Loki to defeat the elf, which for reasons not entirely clear culminates in a huge battle in London complete with a seemingly mad Professor Selvig running around with no pants. The problem with THOR: THE DARK WORLD is that Professor Selvig running round in his pants in pointless but also one of the funniest and most touching parts of the film. Poor Natalie Portman has very little to do as Jane, basically fainting from the Aether and being rescued. Chris Hemsworth's Thor is all muscly and earnest but as little to do. And you guessed it - Christopher Eccleston as the evil elf - is all heavy duty make-up, evil stare and, little to do. The movie is hijacked - thank the Norse gods - by the tricksy evil brother Loki played with delicious malevolent glee by Tom Hiddleston. He's the only actor given anything to get his teeth into, and is an absolutely magnetic presence - second only to Heath Ledger's Joker as the comic book evil villain par excellence. He injects the film with good humour, ambiguity and true charisma. It's only a shame there isn't more of him. I wanted more humour. 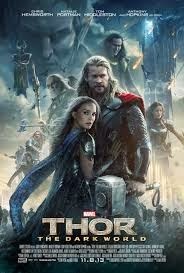 I wanted more odd-couple comedy - more Thor getting jealous of Jane's human love interest - more of Thor getting on the Tube asking the way to Greenwich - but sadly this movie was too dark and gloomy and bang-shouty to let that in. THOR: THE DARK WORLD is on release pretty much everywhere except Japan where it opens on February 1st 2014.